The National Arts Centre (NAC) in Ottawa, Ontario, is home to Canada’s most creative artists. Originally founded by the Parliament of Canada in the 1960s as a Centennial project, the NAC first raised its curtains in 1969. Since then, the NAC has created a national stage for the performing arts and collaborated with artists and art organizations across Canada. 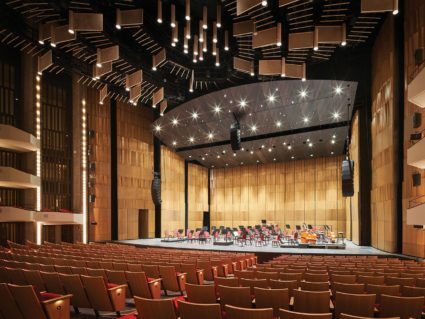 After fifty years, the NAC needed significant exterior and interior renovations, including a new acoustical shell in their largest venue, the 2,000-seat Southam Hall. 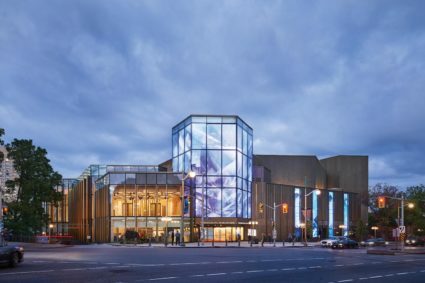 This installation would be the biggest, most complex shell Wenger Corporation ever created and would elevate the audience experience while they listened to the NAC’s world-class orchestra perform. To undertake this ambitious effort, NAC’s team included long-time collaborators Fisher Dachs Associates (FDA) and Diamond Schmitt Architects. They also brought on Threshold Acoustics and Wenger | J.R. Clancy. The process was complicated, as the massive shell had to accommodate the needs of not only an orchestra, but also dance troops, Broadway shows, and spoken performances. Taking an innovative approach that reshaped the orchestra shell and moved the orchestra farther into the audience chamber, the team developed an integrated strategy and project delivery method. Their plan also enabled the team to maximize the efficiency of the design, so they could move forward on the project as quickly as possible. The new orchestra shell would have four main components: Eleven onstage towers, three onstage reflectors, one forestage reflector, and eight forestage towers downstage of the proscenium. Each of the eleven onstage towers can be moved around the stage and set up in different configurations for the orchestra. The three ceiling reflectors are 10 feet long and 57 feet wide. Their space-saving design allows them to be stored above the stage in the fly loft or along the upstage wall to save room backstage. The eight forestage towers vary in height from 34 to 52 feet tall. Half of the towers have doors on each side of the stage as well as double doors at their base for large items and pianos to pass through. 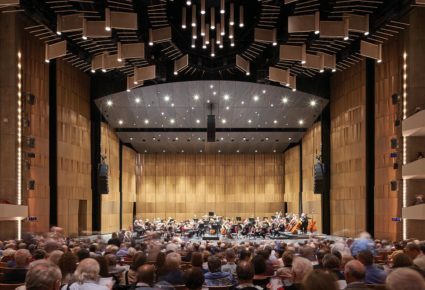 To create a more immediate sound for the audience, Threshold Acoustics moved the orchestra farther into the audience chamber, and Wenger created a 23 x 60-foot reflector to extend over their new space. Before heading to Ontario, the project team gathered at Wenger’s headquarters in Owatonna, Minnesota, to build a full-size model of the installation. Berkley’s team also made sections of the new shell to ensure it conveyed the vision of FDA, Threshold Acoustics, and Diamond Schmitt. Wenger Corporation provided Design Assist with Fisher Dachs Associates to ensure the extensive rigging needs to move the shell into performance and storage position were met. The team from J.R. Clancy designed, manufactured and installed the rigging for the massive reflectors, speakers, and scenic elements such as the house curtain. One aspect of the rigging system includes two line shaft hoists suspending the forestage reflector, which have a capacity of 20,000 pounds each. They fly the reflector from a vertical storage position into the play position with minimal effort and manpower required. After more than 18 months of collaboration, installation of the custom shell was finally complete. The last step for Threshold Acoustics was testing it with a live audience to tune it for the best possible sound. Visit Wenger to learn more about innovative, high-quality products for performance.